If you follow this blog (yippee!) or perhaps if you’ve just stumbled upon it, there’s a reasonable chance that you’re a user of New Zealand’s Back-Country Huts. You might like to consider taking part in an online survey for some researchers working on a project within the University of Auckland’s School of Environment, who are “seeking to understand the significance of tramping huts to their users”. It’s being conducted because they “are interested in the role of tramping huts as symbols and resources within New Zealand’s ‘back country’ landscape and the way they facilitate a particular type of tourism”. 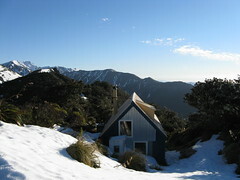 It’s 21 questions, with plenty of space to comment with thoughts about old huts versus new huts, obligations of hut users versus providers, Great Walk huts, hut prices, and various other aspects of New Zealand’s back-country-hut network and its use. Enjoy, and tell your tramping and hunting and tourist and other hut-using friends to answer it too. This entry was posted in musing and tagged academia, department of conservation, huts, link propagation. Bookmark the permalink.